Can new checklist lift Chrysler CSI? 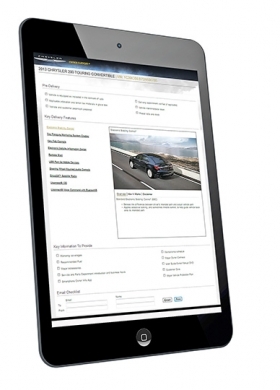 Chrysler's digital delivery software works best on tablet computers. Salespeople receive delivery checklists, and the material is specific to each vehicle identification number. DETROIT -- Chrysler Group, trying to boost customer satisfaction scores, will teach salespeople at its U.S. dealerships to use a digital checklist that employs videos and computer animations to explain vehicle features to new owners. As vehicles become more complex, delivering them has become a key part of customer satisfaction. Chrysler has been working for several years to raise its dealers' low customer satisfaction scores. "We're looking at the sales process and trying to find the areas where our dealers have the best opportunities to improve, and surely, the delivery area is one of our best opportunities to improve," said John Fox, Chrysler's director of dealer training. The delivery material, which works best on tablet computers, displays instruction animations on how to operate each feature on the customer's new vehicle. The material is specific to each vehicle identification number, down to color and features. A salesperson delivering a vehicle goes through each feature on the checklist and uses the videos for further explanation if necessary. After delivery, customers receive an e-mail with a link that enables them to further explore their new vehicle at their own pace, Fox said. The automaker piloted the software and training this month in Ohio and was so impressed with the results that it temporarily suspended other dealer training, Fox said. The automaker began notifying its approximately 2,500 Chrysler, Jeep, Dodge, Ram and Fiat dealerships last week to set up regional sales training sessions. It will require each new-vehicle salesperson in those dealerships to attend. Certification qualifies the salespeople to earn Chrysler sales incentives. Chrysler will not require dealers to equip their salespeople with tablet computers, Fox said. Keith Yancy, senior manager at Chrysler's dealer academy, said he doesn't think the checklist software will add to the time required for a new-vehicle delivery. He said salespeople can use the mobile software to go over vehicle features during lulls, such as waiting for the finance and insurance office. He believes it will help salespeople develop long-term relationships with customers. "Even in the best delivery, you can't cover everything," Yancy said. "What we're trying to do is help bridge that gap, make sure that there's a relationship" between the customer, the salesperson and the dealership. Chuck Eddy, owner of Bob & Chuck Eddy Chrysler-Dodge-Jeep-Ram near Youngstown, Ohio, sent three employees through the pilot training program Chrysler held this month. He said they came back convinced. "It's got all kinds of upside," said Eddy, also a member of the Chrysler National Dealer Council. "You're going to be with the consumer making them feel good about the investment that they just made. And if they've got a question or a problem, they've got the answer right there in their hands." 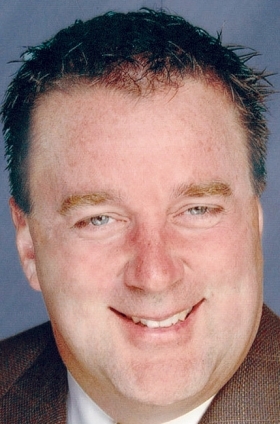 Eddy said the vehicle identification number-specific software may make it advantageous for dealers to buy tablet computers for their salespeople. "You come into a dealership today, and every sales desk has a monitor on it," Eddy said. "If there's another piece that we have to do to make this process better, it's probably a small price to pay if it's a good thing."